The Pumpkin Bath Bomb was first released by Lush as a part of their 2016 Halloween line, when I heard the news that it would be making a return this year I was so pleased. Originally the Pumpkin bath bomb wasn’t the bath bomb I was most interested in from 2016’s Halloween range, its vanilla sweet and cinnamon spicy scent however won me over. I can never resist cinnamon! I have been told by several reliable, pumpkin spice latte fans that the Pumpkin bath bomb is the fresh cosmetics product equivalent. Therefore if a cheeky cup of pumpkin spice isn’t quite hitting the spot for you anymore you may want to indulge yourself by using a Pumpkin bath bomb or two. The Pumpkin bath bomb was actually the first I tried from the rather large loot of products I bought from the very first Lush Creative Showcase back in September 2016. Upon first sniff the Pumpkin bath bomb really reminded me of the Yog Nog bath bomb from previous years. I thought maybe this was its substitute however it really isn’t at all related. The spice in both had me confused. Both are very warming bath bombs and Pumpkin’s warming elements is what first caught my interest, which is why it was one of the first I tried. Suffering with chronic pain I am always on the look out for warm and relaxing products. I am so pleased that Lush brought not only the Pumpkin bath bomb back this year but also spoiled us with another spicy bath bomb, the Christmas Sweater. The Pumpkin bath bomb is a very fast fizzer. I however did not mind this as the quicker it dissolves, the quicker I can lay back and soak up all of its relaxing and warm awesomeness. A lot of people have asked me on Instagram and on here about cutting up bath bombs to make them go further, for example halving the bomb so that you can get 2 baths out of it instead of 1. For some bath bombs I think it would be a Lush crime to cut them up, the Pumpkin bath bomb is however one that I’d say you can split between 2 baths without taking anything away from how it performs, smells and how it affects you (essential oils wise) in the bath tub. Overall I am very impressed with the Pumpkin bath bomb, it might not be as colourful as the other bath bombs currently available but the spiciness with in it has worked wonders on my aching muscles. I will without question be stocking up on these before Halloween has been and gone! Lush shimmer bars are basically massage bars but with shimmer. A bit like a body moisturiser you apply it to your arm legs and possibly chest, working it into your skin just as you would a massage bar. I have also heard of some using it on their face as highlighter. The Goth Fairies purpose is to adorn your skin in shimmer as well as decorate it with a light and fruity scent. The Goth Fairy shimmer bar shares its scent with the discontinued and very much missed, Space Girl bath bomb. It glides on to your skin effortlessly and leaves your skin looking and feeling well nourished with a subtle sparkle which is perfect for a night out. The only negative I have on the Goth Fairy is its small size, I remember being presented with it last year and thinking, ‘oh… is that all of it?’. A little however does go a long way and it is a product you do use sparingly, that is unless you really do want to look like a real life fairy! Overall I do like this product, it works brilliantly on your arms and legs and I feel it gives the illusion of your limbs being thinner and longer. This is obviously not something everyone will want out of it but for this purpose I will be taking a Goth Fairy with me on my honeymoon at the end of the month. Originally I thought that the Goth Fairy shimmer bar was a bit of a novelty product but after using it I can see myself always reaching for it for a night out. It wouldn’t be an everyday product for me but on the rare occasion that I do go out, I would definitely use it. When I found out about 2016’s brand new Lush Easter product the Bouncy Bunny Shower Jelly, I was so excited. What got me the most excited is its ingredients. Much like the Down the Rabbit Hole bubble bar, Bouncy Bunny’s main ingredient is Brazilian orange oil which is one of my personal favourites. Now that Winter and all of its tingly, skin-warming Lush products are becoming a distant memory, I am standing waiting with open arms for all of the spring time, zesty and energising Lush goodies! Bouncy Bunny Shower Jelly has an energising, summery scent that I find incredibly refreshing, especially after an early morning hydro session. I’ve had to cut caffeine completely out of my diet now, (not that I ever drank a lot of it) but since trying to tackle my insomnia head on I have had to become very strict with myself, anything that could help my energy levels without drowning myself with caffeine is gold dust to me. Using this shower jelly gives me a much needed boost when my energy levels are wavering, it’s perfect for me when I think only a cup of tea or 4 will get me through the day. Brazilian orange oil is particularly good for the brightening and toning of skin too, pairing Bouncy Bunny Shower Jelly up with a soft exfoliator will ensure that your skin is more than summer ready. My only negative on this shower gel is its shape, I however do not dislike the shape, I think it’s cute that they’ve used the exact same mold for the Bouncy Bunny as the Spring Bunny bath bomb. I just find shower jellies that are the standard shape a lot easier to use if you prefer to use them whole like me. The character shaped ones are very tricky to keep a hold of. Trying to keep it in your hand while using it is quite the challenge. I am sad that this shower jelly didn’t come back in 2017’s Easter line, it is however making an appearance in the Lush Kitchen on Monday (17th April 2017) so at least some of us can still get one if we want! Back when Lush Cosmetics was shiny and new to me, the first lip scrub from there that I tried was the Bubblegum lip scrub. I was seduced by its bright pink colour and until I actually tried it I had no idea of the true potential of Lush lip scrubs. I use Lush lip scrubs all the time as I have an awful habit of biting my lips in my sleep. They are a quick and easy way to exfoliate dry or chapped lips; For everyday use or just for prepping your lips before adding a splash of colour. Today I am reviewing the Chocolate Sugar Lip Scrub that was originally released in the Lush Kitchen back in August 2016. Luckily for those that missed it, as of the 10th of March it will be available for a limited time in the UK as it has been chosen as the leading lip product in Lush’s 2017 Easter range. The Chocolate Sugar Lip Scrub has the most amazing scent. What first hits you on the opening of this mini jar is pure CHOCOLATE. Predictable? yes, but it is literally like a creation from Willy Wonka’s chocolate factory, there’s just something so special about it. Alongside the chocolate there are also hints of orange, it really reminds me of Terry’s Chocolate Orange and when I think of that I think of Christmas! Not only do they not work as well but they also do more harm than good to our environment. There is a very interesting article written about the use of microbeads in cosmetics on the Lush website, the full article can be found here. For the purpose of this review I have pulled a short paragraph from it to better explain the problems with using unnatural ingredients in cosmetics. Not only do Lush’s natural products work but they also help us maintain a healthy planet. Sometimes less is more and if all of the ingredients are natural and cruelty free, even better! To use Chocolate Sugar Lip Scrub, put the smallest amount onto your finger then gently buff onto your lips. The sugar helps smooth any bits of your lips that don’t appear perfectly polished, (dead or dry skin being the most popular culprit). The sugar lip scrubs are also in fact great for moisturising the lips because of the jojoba oil in them. I however like to finish off with an extra layer of lip balm just so that I keep on top of having beautifully hydrated lips. Lush Sugar scrubs and lip balm really are the winning combination of lip products for soft, smooth and kissable lips. If you haven’t tried a Lush Sugar lip scrub yet then please do. You won’t be able to live without it and you’ll want to collect them all! Last year (2016) I thought that the Valentine’s Day range was Lush’s best Valentine’s one yet. I honestly wasn’t expecting very much quantity wise. After all, the Christmas line that finished only a month before had spoilt us rotten. Stating the very obvious, the Valentine’s line is always the first line to come out once the New Year is in full swing, after all of the busy Christmas work Lush has done over the last few months, you would expect them to calm things down a little. They however never do and the Valentine’s line of 2016 blew my mind! My expectations would have been fulfilled with 2 or 3 limited edition, lovey-dovey themed products. I would have been perfectly satisfied with those 2 or 3 too. As for 2017 we are only in January and Lush Cosmetics have over excelled themselves again. 2017’s Lush Valentine’s line, blows the likes of 2016’s out of the water. Lush never fail to surprise me and this is why I have made them a part of my everyday life. 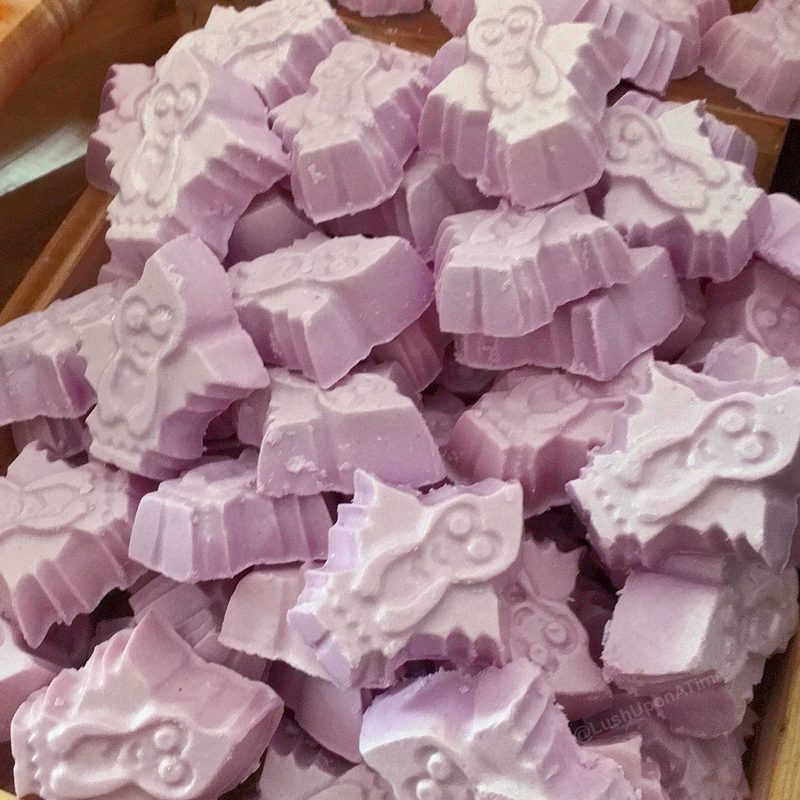 The Love Spell Massage Bar was first released as a part of 2016’s Valentine’s range as an Oxford Street exclusive. Imagine my delight when I found out that for Valentine’s 2017 it would be making a return and not just as an Oxford Street exclusive but in all stores and online too! Love Spell’s scent is a hard one to describe. It has a subtle and musky rose aspect to it. It is a very gentle scent, after using it I feel content, relaxed and carefree. Though the design of this massage bar is very simple, it really stands out to me when it is in amongst the other Lush massage bars. Love Spell leaves my skin smooth, well hydrated and smelling gorgeous. Lush really need to make a dusting powder that shares its scent. Although Love Spell isn’t my favourite massage bar but it’s up high on the list of my must haves. The beautiful shade of pink and its heart design will catch many peoples eye. As I mentioned in my review of the Tender is the Night massage bar, massage bars can be used as body lotion too. The sky really is your limit when it comes down to Lush products. I love how versatile they all are. Love Spell is a fantastic addition to the Lush massage bar collection and I wouldn’t be at all surprised if Lush decided to add it to the every day, all year through range. Last year (2016) the Rose Bombshell Bath Bomb was revamped beyond recognition for Lush’s Mother’s Day range. With it being completely unrecognisable to versions previously released, I was very excited to get hold of a few. The newly designed Rose Bombshell was a tremendously positive and much needed face lift, I loved it. I was therefore super happy when I found out that Lush had decided to bring it back for this years Valentine’s day range! Changing from a plain white coloured product resembling Lush Oxford Street’s Ylang Song bath bomb to an almost neon pink one is always a good move in my personal pink-mad opinion. Not that I don’t love the Ylang Song bath bomb, I just tend to gravitate towards the pink products more because I’m pink obsessed. Upon hitting the water the Rose Bombshell Bath Bomb immediately starts to fizz. It slowly changes your bath water to a crisp and pale pink. As the Rose Bombshell slowly fizzes away its greenish blue interior begins to show. As this external layer of the bath bomb is gradually revealed the bath water becomes a deeper more vibrant pink. Packed with rose absolute this bath bomb is a real treat for dull and tired skin. With the Rose Bombshell having both skin-soothing and moisturising properties, it is a bath bomb that you will want to use time and time again. After getting out of this bath I could still smell the light floral and rose fragrance of Rose Bombshell on my skin. It wasn’t until I got out of the bath that I truly started to appreciate its fresh, beautiful and lingering scent. Once this fantastically zingy-floral bath bomb reaches its last layer a handful of soft yellow rose petals burst out floating to the water surface. Like the Lovestruck bubble bar, Rose Bombshell also contains geranium oil, I am not a fan of geranium at all, Rose Bombshell’s other ingredients seem to however compliment it well making it a fragrance I do enjoy. The multicoloured bubbles that Rose Bombshell left on the surface of the bath were so, so pretty. I just had to take a few more photos before I got into full bath mode. Out of all of the seasonal, limited edition products that Lush threw at us last year (2016) this limited edition bath bomb was one of my favourites by far. I have said several times in previous reviews that some of the limited edition products such as Rose Bombshell would make a fantastic addition to the staple, every day store products. A year on and I still feel that Rose Bombshell is worthy of that. It really is a remarkably refreshing bath bomb that I feel I will never, ever get tired of.